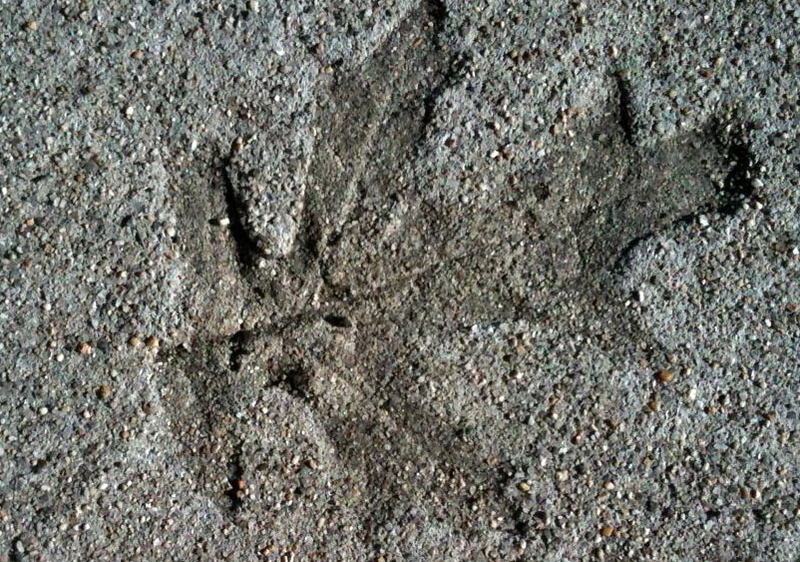 Inspiration is everywhere, even on the ground. 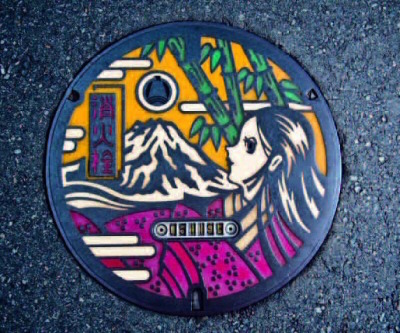 As the Japanese upgraded their below-ground systems in the 1980s, towns designed individual manhole covers that reflected nature and the customs of their surroundings. Today, nearly 95 percent of the 1780 municipalities in Japan have created unique manhole covers. The success of the manhole cover project is linked to the Japanese aesthetic sensibility of shizen, says Remo Camerota, which means “absence of pretense.” The manhole cover project was successful, he continues, because the [manholes] reflect the environment, very much noticeable but never intrusive. The nature and culture inspired manhole covers are exquisite, full of identifiable plants, animals and even images of people from Japanese legend in historical costume. Most are painted in full color. When I came upon them in Japan, I was stunned that such lovely objects were driven on in the street and I almost stopped traffic when I stopped to look at one. If you can’t get to Japan, images of these manhole covers are everywhere on the web. Camerota’s book, Drainspotting, was published in 2010 and contains about 90 color images. Prices ramge from $75 to $100 on Amazon. An iPhone app with locations of manholes, maps, and full color pictures is available on iTunes. Out in Micronesia, 2500 miles southwest of Hawaii, the Marshall Islands lie scattered in the Pacific. In fact, they lie closer to Japan and Australia than to the U.S. mainland. 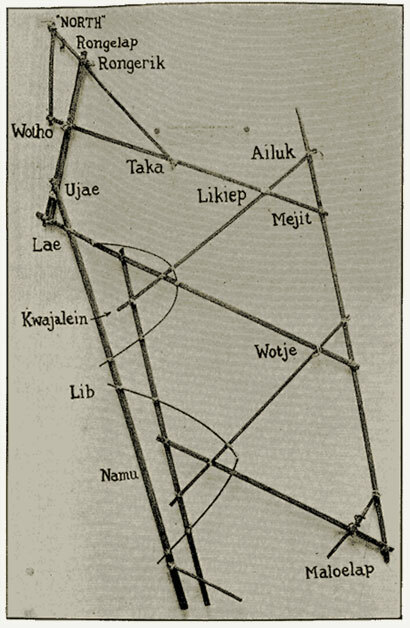 This Marshallese stick chart (photo by W. M. Edwards), rebbilib in Marshallese, marks the islands and major wave patterns of the Marshalls. Long ago, I lived on one of the largest Marshall Islands, Kwajalein, which is only one-half mile wide by two and one-half miles long. At the time, Kwajalein seemed as large as any home town but, on a world map, Kwajalein is almost invisible. Marshallese navigators made these charts using cowries (the tiny brown shells you see in the color photo) and palm fronds right up until World War II. The rebbilib is most like our modern maps, with shells showing specific islands and their relation to one another, like cities in a state. Yet Marshallese navigational charts are not like our western-style maps–fishermen didn’t use them to measure distance or count miles. Instead, they used them as memory aids, reviewing them before a journey but not bringing them along. It is said that a fishermen would study his charts, leave them behind, and then lay on his back in the canoe the better to feel the rise and fall of the ocean swells. He interpreted the map with his body memory, not with his eyes. Why do we make maps? Why is the spare geometry of ocean swells so beautiful? German artist, Adrian Lohmuller, created a series of collages last year based on these patterns, inspried by their irregular, evocative shapes. 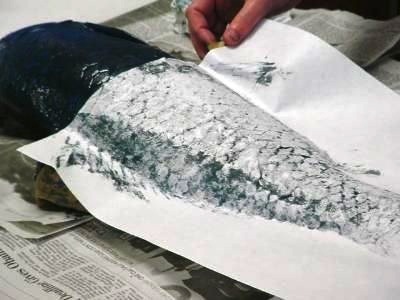 If you’ve tried fish printing, or gyotaku, you know how much fun it is. Last week I printed an eight pound golden carp; its thumbnail sized scales made for a beautiful fish print. I filled out the fish order with butterfish and squid. 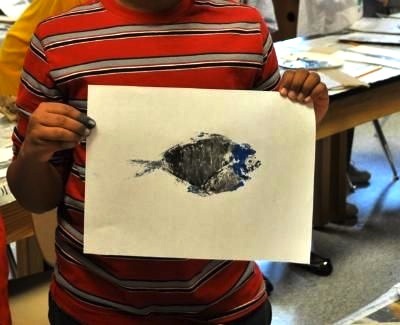 The butterfish have tiny scales, but they are flat-bodied and small, a tough little fish for student printing. Squid are amazingly resilient and make great prints even after being swung around by their tentacles! Flounder make fascinating prints because both eyes print on the top side of the fish. But one afternoon a flounder had been printed once too often… the guts flew…and now I use a rubber one. 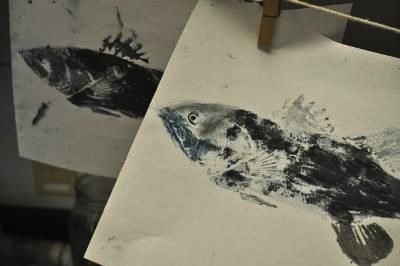 For more about fish printing and nature printing in general, check out these two books: “Nature Printing” by Laura Bethmann, and “Natural Impressions” by Carolyn Dahl. For videos on the technique from a Japanese master printer, see Mineo Yamamoto’s work at this link. Some people paint on canvas, but me… I like pizza boxes. Used or new, the cardboard has the right spring against my brush. Contemporary art is often painted on a square and, with pizza boxes, that square can range from 16 inches down to seven. I use acrylic paint on the boxes, I don’t have to frame them, and they dry fast. But my idea isn’t original. If you’ve eaten at a California Pizza Kitchen, you probably have noticed the art — all painted on pizza boxes! As we waited for a table one packed Friday night, I suddenly realized that I could paint on pizza boxes too. That night I sped home, flung the leftover pizza onto the kitchen counter, and painted a color wheel shaped like a pizza. The painting would have gone faster if I had primed the box first: the lettering and logo kept showing through. You can use any opaque color of acrylic paint for priming, but everyone has white. 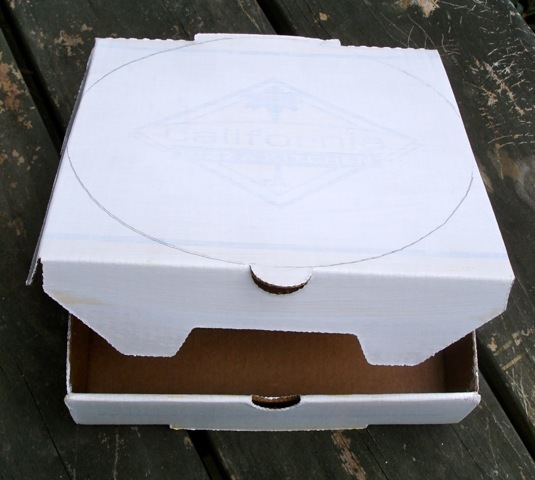 I don’t paint the bottom of the box for two reasons: 1) If I did, I wouldn’t be able to set it down to dry because it would stick to the table and 2) the logo or box measurement on the bottom of the box is proof…that this really is a pizza box. I haven’t exhibited these boxes in shows because I face a few technical difficulties. First, the sides of the box bow outward slightly, creating a shadow along three sides of the top. I have tried gluing these sides to the top, but it is tough to clamp the sides to the top without crushing the box. The second difficulty is framing. 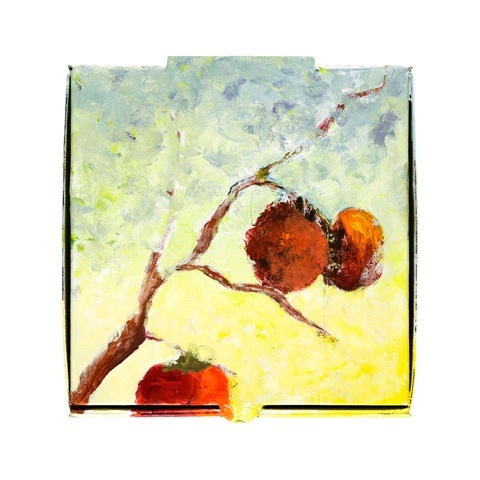 At CPK, several boxes are grouped together and framed under a two-inch-high sheet of plexiglas as one painting. That seems right for art in a commercial space, but bulky for a home. I like the fun of inviting people to touch a painting and the informality of standing it on a shelf for exhibit. I painted these persimmons on a seven-inch box. Most pizzerias will give you a clean box if you ask, and CPK has them in 7, 10, and 14-inch squares. Does this remind you of anything? The color of dandelions, maybe, and their floating seeds? The Pattern Sourcebook: Japanese Style 2: 250 patterns for Projects and Designs contains 250 full-color images of historic Japanese fabric patterns, many of them based on the tiny repeated dot pattern you see in the dandelion, above. The dots themselves were stenciled onto dyed fabric. Some are so evocative! The green one, of fiddlehead ferns, dates from the mid-1860s. The book includes a CD of 250 copyright-free images. Most designs repeat evenly, like wallpaper, which will allow you to copy and paste them as tiles in Photoshop. You can also change the original colors and combine patterns as you wish, perhaps creating your own business cards or website. 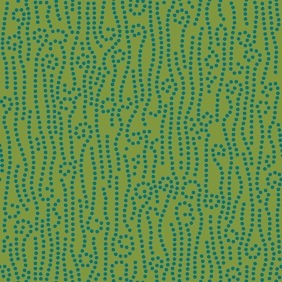 Try changing the background color (or the dots) and see how the mood of the piece shifts! 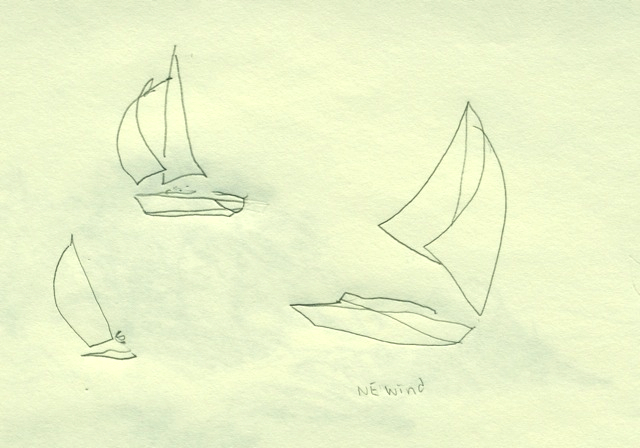 Good art doesn’t have much to do with exactness: it’s about the feelings you get down on paper. 1. I must already be able to draw and, since I can’t, it’s too late. The top fear of everyone. Drawing is a skill that can be learned anytime. Let me give you an example. You’re good at reading because you practiced during school, over and over again. Chances are you didn’t practice drawing more than a few times in art class…before you went on to try clay or painting. Give contour drawing a try: “Drawing on the Right Side of the Brain,” by Betty Edwards, still has the clearest instructions around. 2. I need expensive or special tools. I love the tools of art: delicious new colors, accurate mechanical pencils…but you don’t need lots of tools. All you need is a number 2 pencil and blank paper. I bring along an eraser, just in case. 3. I don’t have enough time. Where do you spend time waiting? What would you like to draw? Give it a try, starting is the hardest part! In Honolulu, it’s Diamond Head that follows you everywhere–on the beach, through the city streets… Here in Marblehead, Massachusetts, about 20 miles north of Boston, it’s the lighthouse. All the artists in town paint the lighthouse. If you’re a realistic marine painter, it’s important to include all the bracing on each of its four legs, just as you would include accurate drawings of the rigging of a boat you were painting. 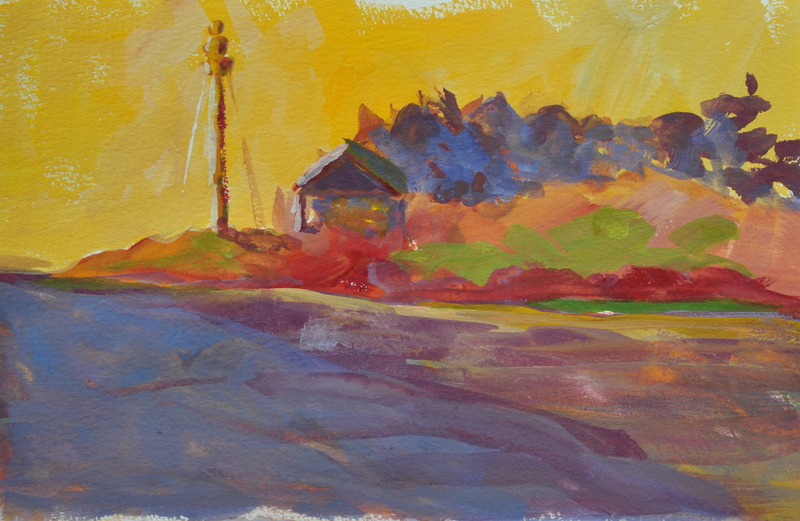 I’m painting with opaque watercolors, called gouache. They have a velvety finish when dry and clean up with water. 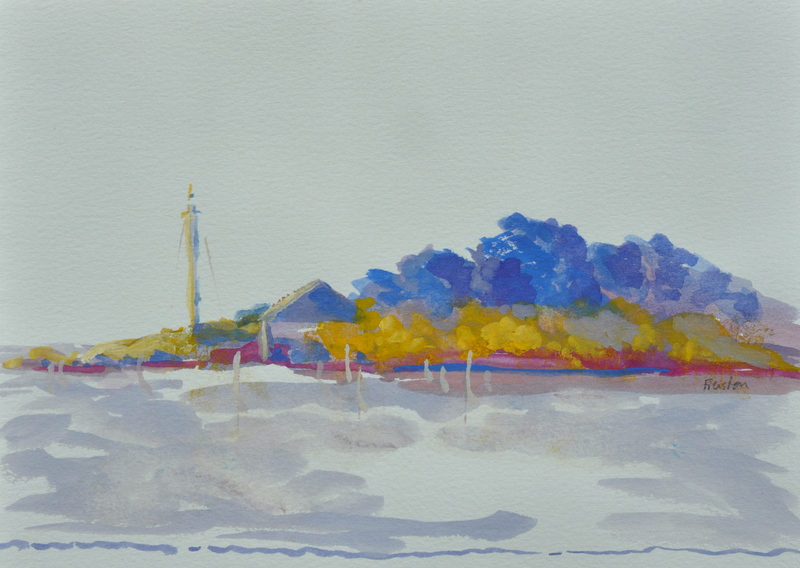 They come in small tubes, and I simply squirt color (about the size of a dime for a sketch) onto a coated white paper plate when I’m setting up my palette. I throw the plate away when I’m done painting. You could also use a white glass plate or metal butcher tray as your palette, but I like to travel very light when I’m painting outdoors. I paint on regular watercolor paper with the usual brushes. Gouache is easy to travel with and, if you’re traveling by air, the tiny tubes will fit in the zip-lock bag required by the TSA. I hope you give it a try wherever you may be in August! An ear of corn. You can see it in your mind’s eye: the opalescent kernels, the raspy, coarse leaves…we choose an ear by weighing it in a hand, hoping the heaviest ear is the tastiest. The last of the corn is in here in Maryland, the season ending with the delicious Silver Queen. It takes over 90 days for the white-kerneled Silver Queen to mature, with some cobs measuring over 12″. New England has Butter and Sugar, a yellow and white heirloom and, in early August the tiny, tender Delectable, but the massive ears of Silver Queen have a gravitas that the others lack. I so loved one ear that I couldn’t bear to cook it. I started to: I peeled back a few leaves, touched the shiny kernels, thought of the meal it would make…but I decided I wanted to remember it in its perfect state, unhusked. I set it on the dining room table to draw. I opened my sketchbook and took out a thick, dark 4B pencil which somehow matched my excitement. I knew I would be tempted to draw every little kernel, so I drew fast. I didn’t want to get stuck in the perfect rendering of every little shape, I wanted to capture the essence of corn. 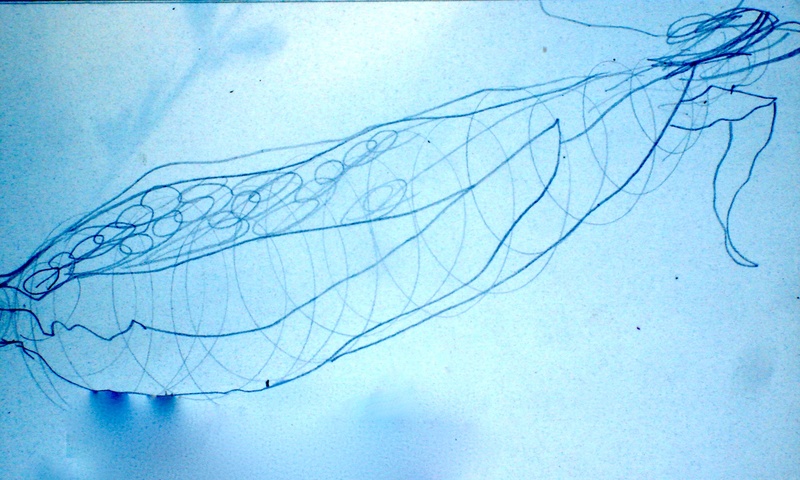 But the first drawing helped me understand the shapes that make up corn. By the second, I knew I wanted the kernels to star. But how to set off their pale yellowness? Not with realistic green, but with their complement across the color wheel, red-violet. Matisse and the Fauvists angered the European art world with their use of complements back in the early 1900s: red against green, yellow against purple, but 100 years later, our eyes revel in the vibrations of complements. I drew the ear a second time, added a light watercolor wash, and went over the drawing with colored pencils. Jane LaFazio is a master at creating fabric art and postcards from the ideas she develops in her sketchbooks. You can find the free tutorials on her website here. Say you’re in Honolulu. 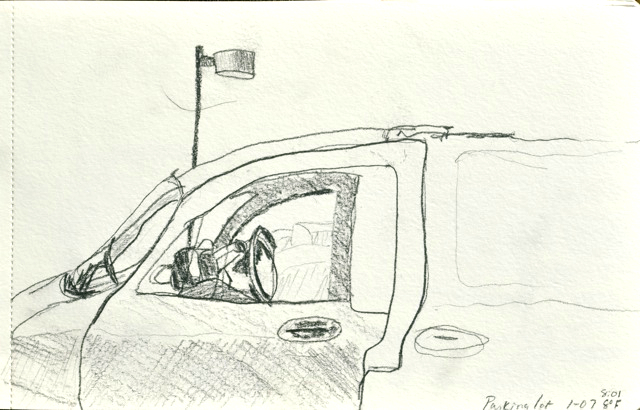 You’re sitting in the shade, on a seawall, and you have your sketchbook, brush, tiny traveler’s paintbox next to you. And your ice-coffee. Birds whistle as they fly past into the palm trees. In front of you is Waikiki Beach, all amazing blue-green water and pale sand. A woman opens her beach umbrella in front of you, and it is the perfect complement to the water, a gorgeous orange-red. You have to paint it. I painted with iced coffee. I poured a bit of coffee into the lid and used it instead of water to wet the paint. The colors are duller than they would have been, but the coffee-stained sand is the perfect shade of tan. The coffee dried slick and shiny, so I couldn’t go back and fix the color once the sketches had dried. When I tried, the new paint simply beaded up on the surface. 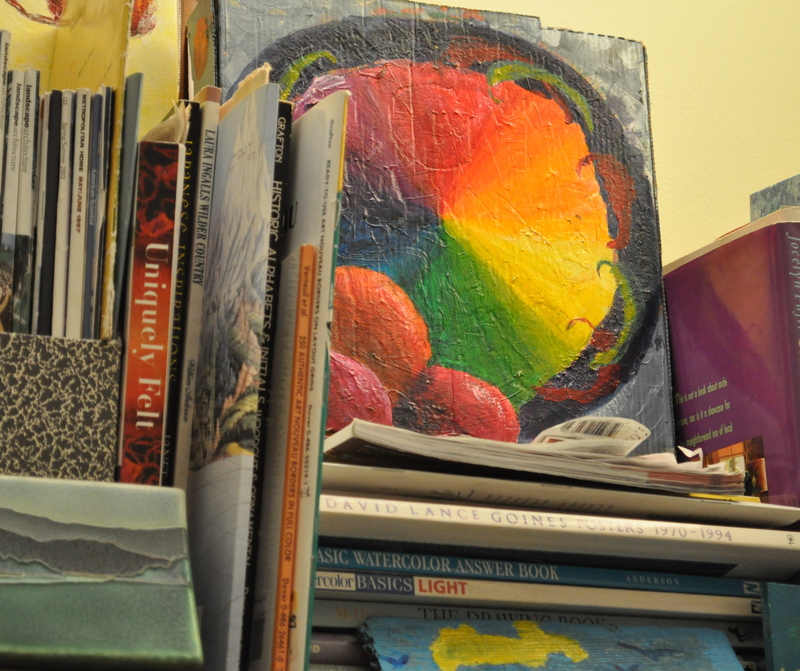 The colors in my paintbox smelled like ice coffee for a few days afterward but it didn’t affect the colors. 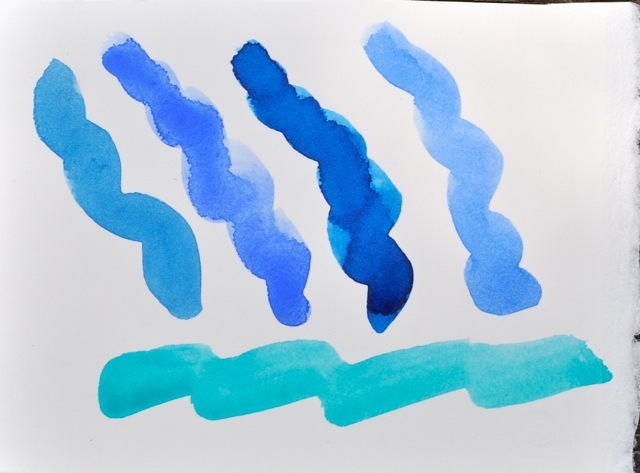 French ultramarine, second from the left, is the blue-gray of the Atlantic up in Boston. But Honolulu takes its water from the blue-green Pacific. For the trip, I treated myself to a tube of cobalt teal, a color one I use nowhere else, and the perfect color to use on Waikiki Beach. Cobalt teal runs along the bottom of the card. So, iced coffee will work, but I hope you won’t have to sacrifice a cool drink to your art! What do you bring home from your travels? Seashells? Photos? T-shirts? Me too. 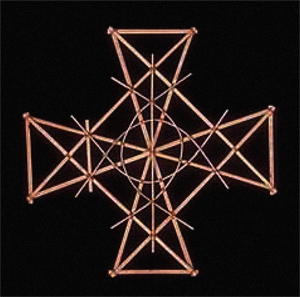 And I bring home another thing: drawings of a natural symbol, a thing I’ve drawn repeatedly, or a new shape that caught my eye. I can never predict what it will be. One year it was crab claws. 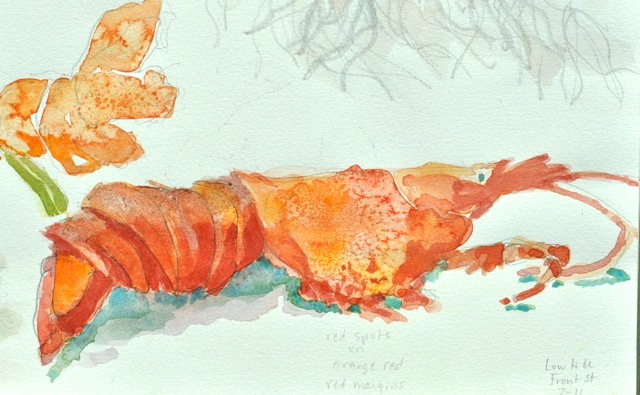 I drew them open, folded, on top of seaweed, in the sand. I didn’t realize myself how often I’d drawn them until I looked back at my sketches. 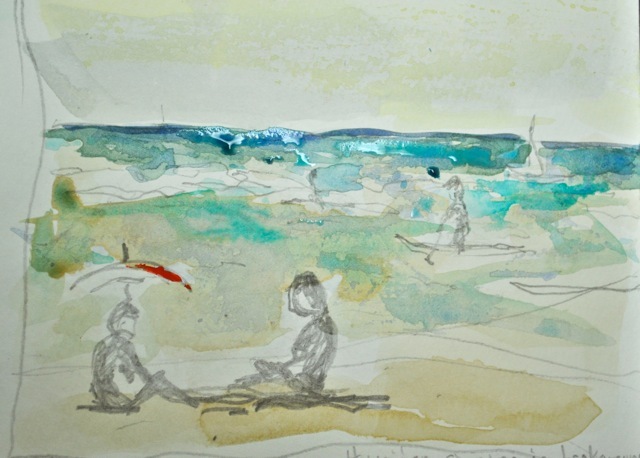 Last month, I drew Diamond Head, the volcano at the east end of Waikiki Beach in Honolulu. Its iconic silhouette is a background for the city; if you forget for a minute that you are in that Hawaiian city, you have only to look to the East to remember. Diamond Head’s Hawaiian name, Le’ahi, means “ridge “and “tuna,” perhaps referring to the dorsal-fin like shape of the volcanic cone itself. 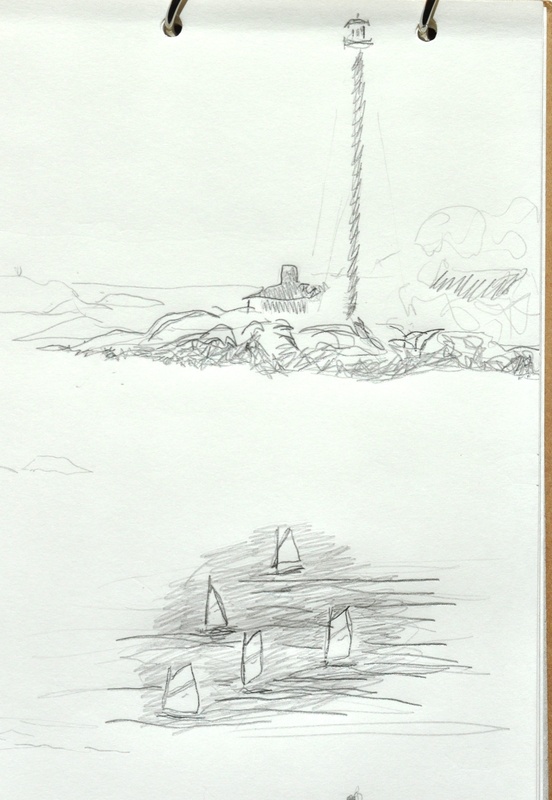 Here are two sketches of the very top ridge I made looking back at the volcano from the beach. It was hard to capture the exact angles at the top ridgeline. Do you have a fresh concrete sidewalk? If you do, you can keep autumn leaves and their lovely shapes around a bit longer. 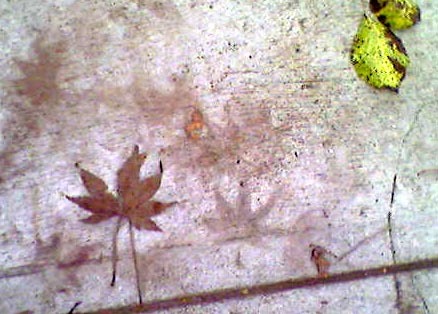 Tannin prints, with their lovely sepia tones, show up best on clean, unsealed concrete sidewalks. Though chlorophyll is absorbed back into a tree before leaves fall, tannins are not. Autumn rains have washed tannins out of the thin leaves of this Japanese maple. 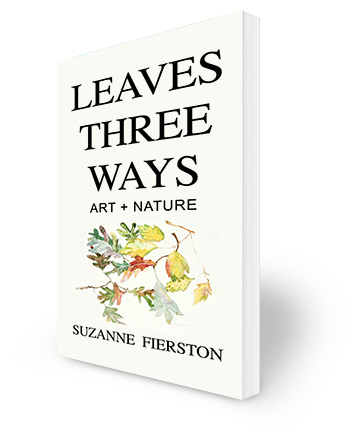 Oak leaves contain the most tannins of common tree species, but we rarely see prints from the oak because its thick leaves break down over years, not weeks. If you’re a fresh, unfallen leaf with a high concentration of tannin, animals, bacteria and fungi will avoid you. Ditto if you’re an unripe fruit like a quince or persimmon. I can’t speak for the bacteria or fungi, but the animals are likely avoiding tannin’s astringent taste. 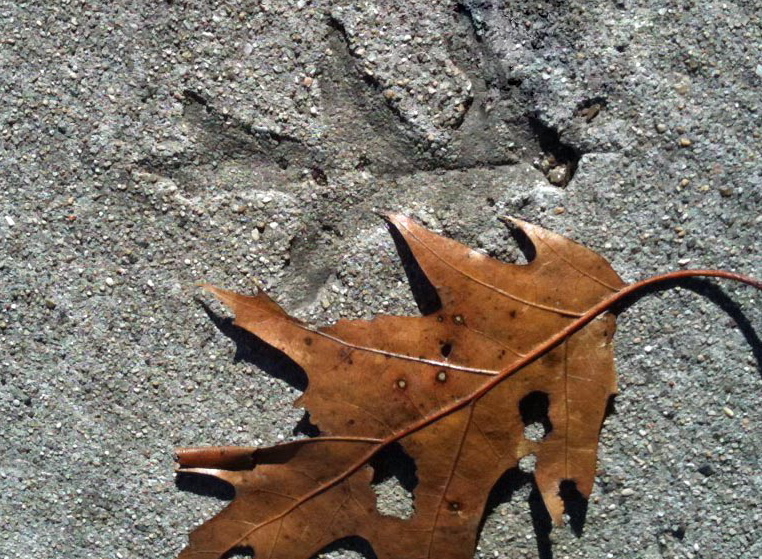 You can get swept up in a search for unique concrete prints…though I like best the tiny hands of the raccoon and the eternal vows of love.